Check out the following groups and plan to come to at least one of them. 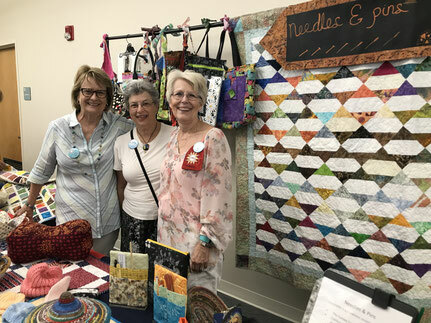 It is a great way to make friends, learn about the guild, work on your own projects, or select a group that makes quilts to donate to wonderful organizations. 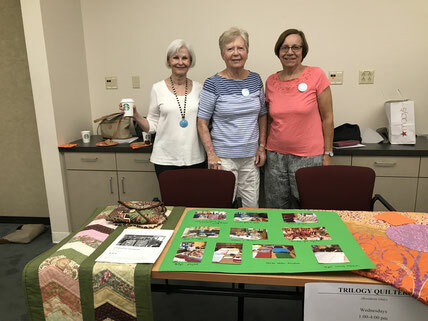 The photos below are from our Friendship Group Fair, June 2018. 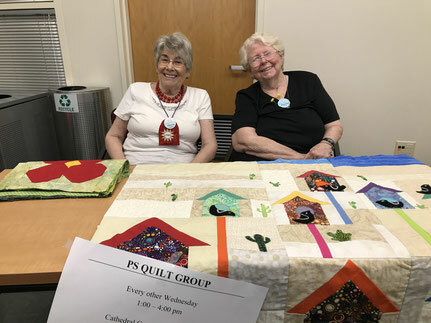 Very informal get together, open to all longarm quilters, hobby and professional. 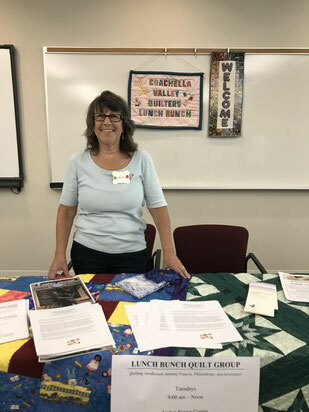 Dedicated to making quilts for the New Life program at the CV Rescue Mission, and the Olive Crest which serves foster children. Contact Paul Reiss for more directions. 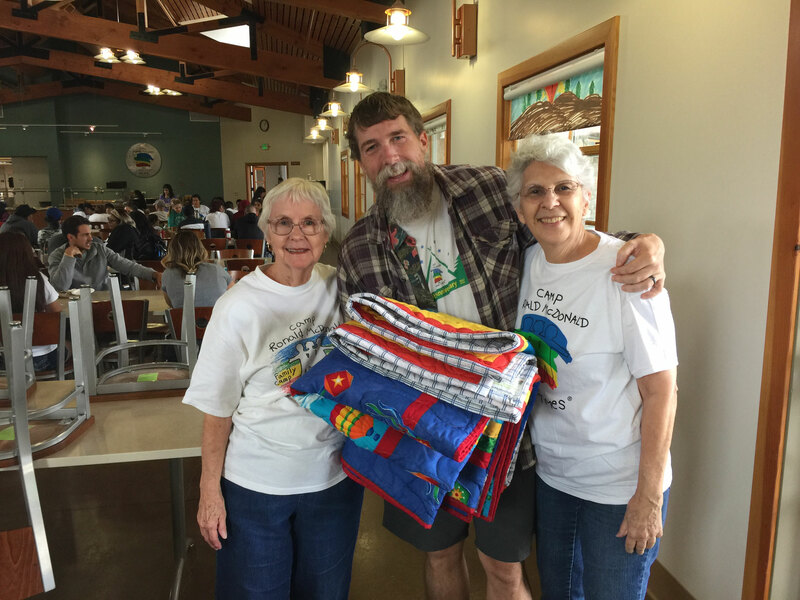 Over 200 quilts to Olive Crest! 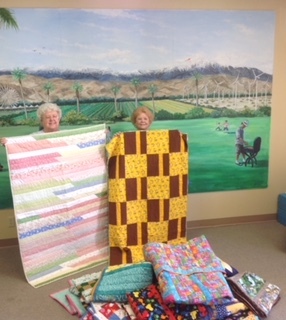 Stitches for Kids Friendship Group, Deep Canyon Friendship Group, Rancho Casa Blanca Quilt Club (Indio) and the Coachella Valley Quilt Guild worked together to donate over 200 quilts to the children and families at Olive Crest. 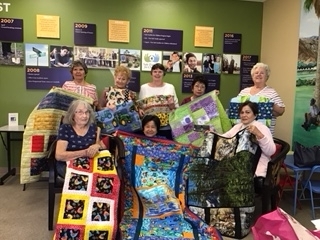 These quilts were presented during a spring event and put smiles on the faces of children and families whole receive support through Olive Crest. 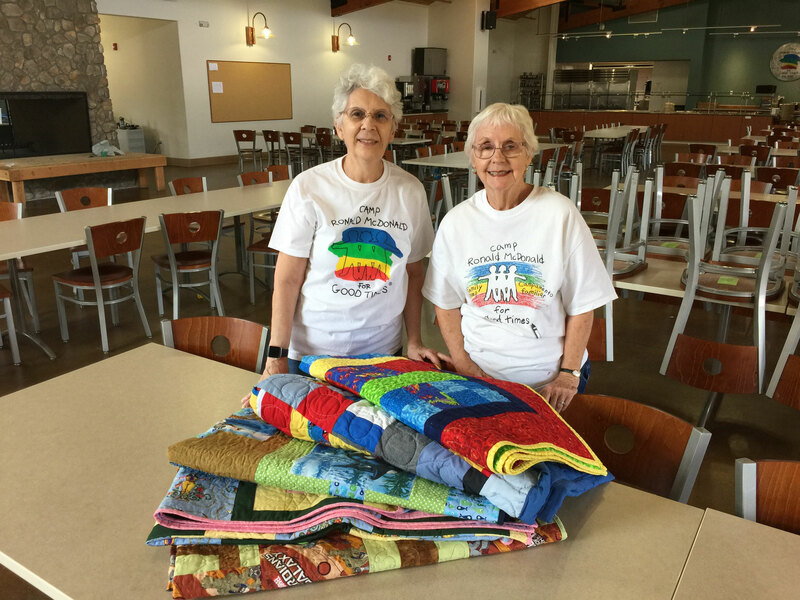 Pictured above are guild members Patricia Page and Natalie Shonerd who delivered the quilts to Olive Crest. Thank you to all those who helped in this endeavor. 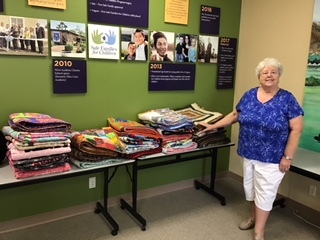 In December 2018, Patricia Page from our friendship group, Stitches for Kids, delivered 22 quilts to Olive Crest. 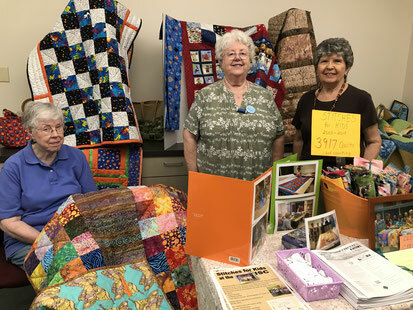 Stitches for Kids donated close to 200 quilts to this organization in 2018!! What a wonderful job they are doing! 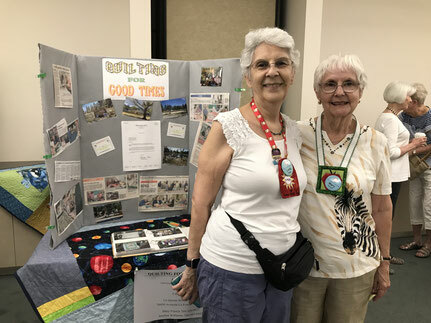 Mary French and Linda Blake, members of our Friendship Group Quilting for Good Times, La Quinta, went to Ronald McD Camp in Idyllwild and gave away 7 Quilts. (5 to children and 2 to the Nurses) Chad, the camp director, accepted them on their behalf. They had a very rewarding day. The families were very appreciative and gave them many hugs. 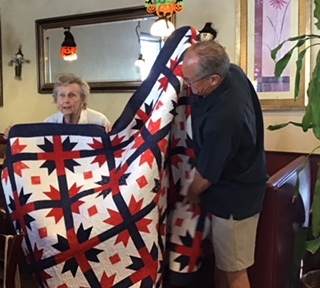 Veteran and Stitches for Kids member, Joyce Olsen, received her Quilt of Valor at a recent luncheon. 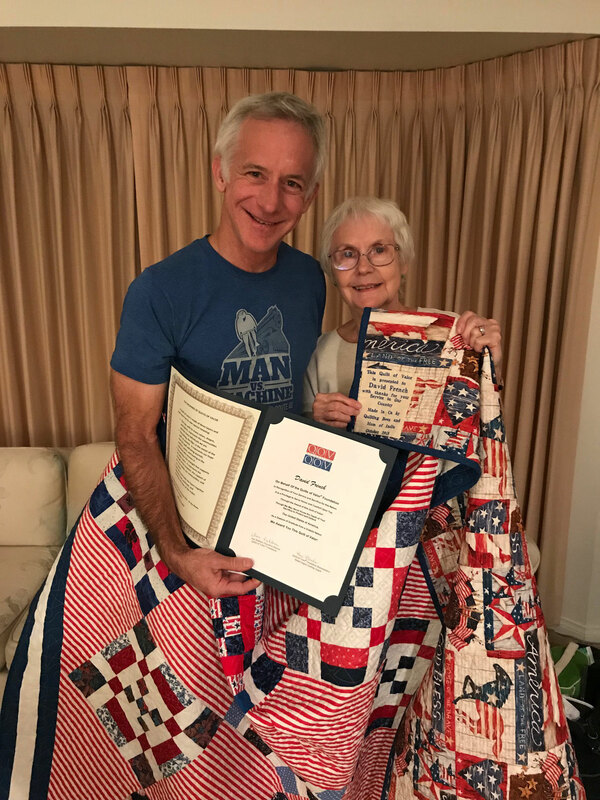 Her son joined her for this wonderful recognition of her service to our country. 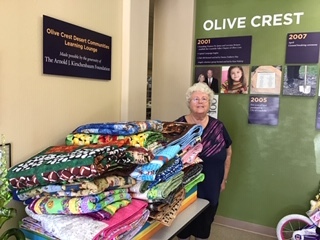 Stitches for Kids quilters delivered quilts to Olive Crest for foster children. 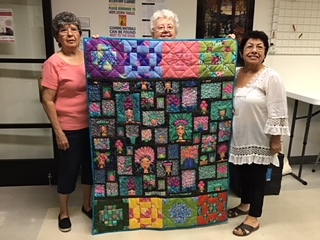 Stitches for Kids donated this quilt to the Friends of the Indios Senior Center for their craft fair to be held on November 2. 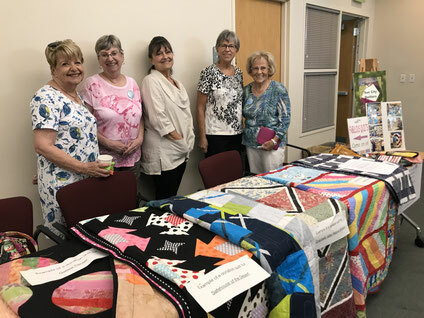 This friendship group meets at the Indio Senior Center on Tuesdays. 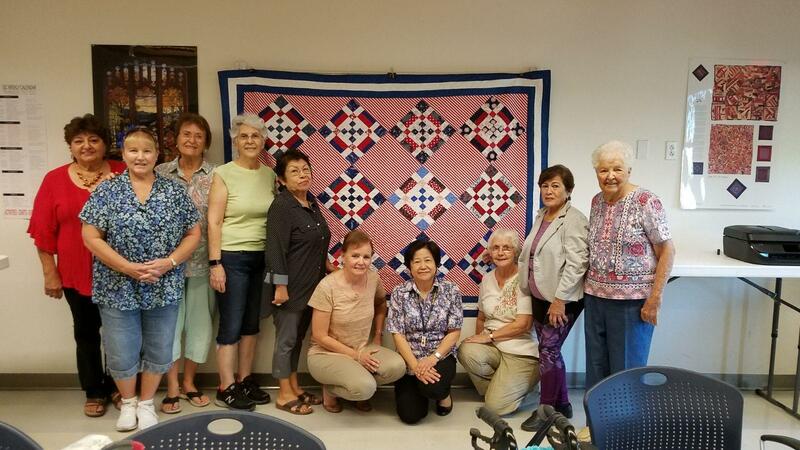 Our Friendship Group, Quilting Bee Show and Share, Indio, presented a Quilt of Valor to David French in October 2018. 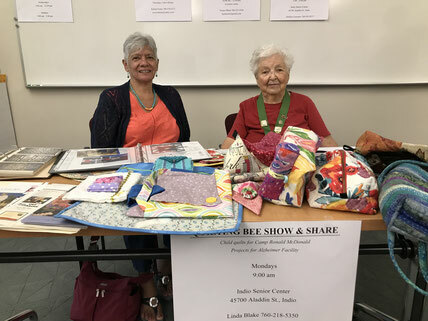 David is the son of Mary French, a member of Quilting Bee and the guild. Thank you, David, for your service to us and your country. 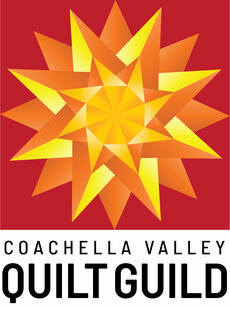 Enjoy the quilt!